I have used one of the patterned papers as my base. I have used modelling paste to stencil a pattern. I have used lots of pieces of the patterned papers which I have torn corners off, and distressed them and then layered them up on each corner. I have used one of the Kaisercraft Lucky Dips wooden words for my title, and one of the cute little envelopes layered with a Puffy Heart Sticker from Bella Blvd. I have fussy cut clusters of flowers from the papers and have layered these with cards and pieces from the Ephemera pack. I loved all the floral elements and whimsical pieces to this collection. I hope you like it too. 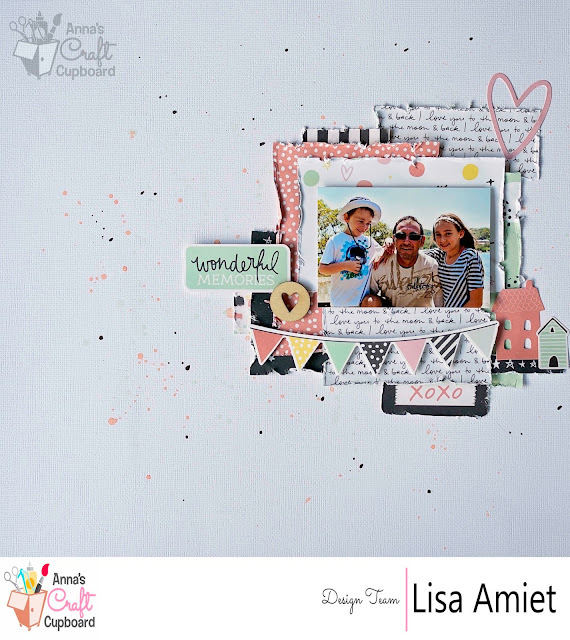 My next layout to share with you is 'Smile' I have used the Kaisercraft Daydreamer Collection from Anna's Craft Cupboard. For this layout I have again used paints and inks to splatter my white base. In the bottom corner I have layered some of the elements from the Collectables Pack with a wooden frame from the Lucky Dip pack. I have also added a couple of stickers from the Sticker Sheet. I have also added a few of the white puffy stars from Bella Blvd. I have used the "smile" as my title, from the stickers sheet. A couple more of the puffy stars along with the cute yellow arrow sticker from the sticker sheet. To finish it off I have used a wooden veneer arrow piece from the Lucky Dip. I love the beautiful mint green in this collection. Such a fun collection to work with. I'm back today to share another layout I have created. For this layout I have used some gorgeous 7Dots Studio papers, a mix of Writers Block and Cotton Candy Dreams. 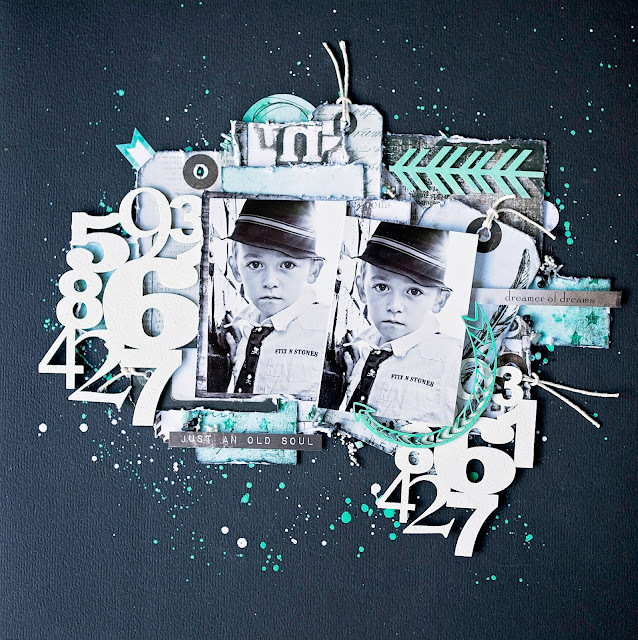 I have used lots of 2Crafty Chipboard Including both of the "Numbers Panels" which I have embossed in white. I love how they pop on the black base. I have also used one of the "Arrows Funky" which I have finished with some acrylic paint to match my papers. I have layered this on top of one of the numbers panels. Awesome word stickers from 7Dots Studio, these fit perfectly with these pics of my son. I have also used one of the "Aidans Arrows" which I have cut in half and finished in acrylic paint. I have layered this with lots of the tags from 7Dots. I really love how this layout turned out! I hope you like it too. I have a new layout that I have created to share with you all. For this layout I have used 49&Market Scents of Nature papers. 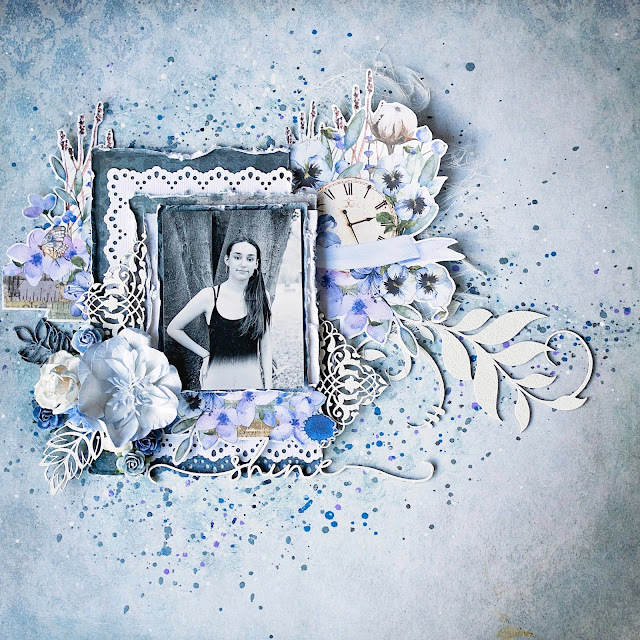 I have white embossed most of my chipboard for this layout. I have used two of the "Leafy Silhouettes", one of them I have finished in a dark blue, the other in white. I have used lots of fussy cut elements from the papers. For my title I have used the word shine from the "Fine Word Set 2"
I have also used one of the "Elements Set 2" which I have cut in half and layered among my papers and elements. Lastly I have used one of the "Leafy Shrub Set 1" layered among some of the fussy cut papers. I hope you like this layout, and I will back soon with more to share! I love the geometric print on this paper, so I cut them out and raised them with foam tape to add dimension. I have layered these over some of the beautiful papers. To finish off I have used another gorgeous flower from 49&Market, "Vintage Shades Cerise Bouquet'. I am here today to share some scrappy goodness with you all. is full of lovely colours, lots of really cool elements and was lots of fun to work with. 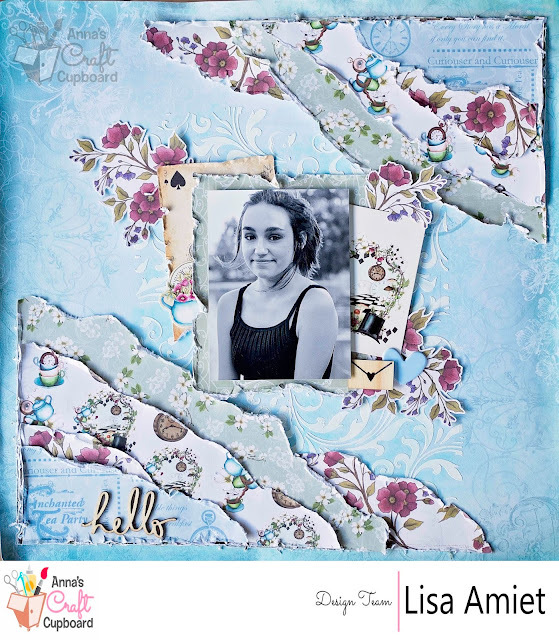 For this layout I have used a few of the patterned papers, which I have distressed and layered. I have also splattered some paints and inks on my base. I have used a couple of the little house stickers from the Sticker Sheet. They are so cute! I have layered these with the a banner from the Collectables Pack. My title is also from the Collectables Pack. I have also used a cute heart cut out wood piece from one of the Kaisercraft Lucky Dips. Lastly I have used a heart sticker from the Sticker Sheet to add to the corner of my layers. I hope you like my layout! I'll be back soon to share some more with you!